It’s unfortunate that Swedish meatballs, which has now come to represent Swedish food in general to everyone outside of Sweden, is viewed as a cheap, lowbrow dish that’s more about heft and less about taste. Certainly not helped by the likes of IKEA which markets its Swedish meatball plate–one-dimensional in taste and uninteresting to look at–for less than $5. At its very basic, yes, Swedish meatballs is a meat-and-potatoes dish that was probably, and continues to be, meant as a filling meal to power through the cold days of Scandinavia. But traditionally, it was also considered a special occasion dish, as beef was a luxury item. As with any classic dish, likely every Swedish family has some version of the recipe that’s tried and true. Some recipes call for all beef, while others, a mixture of ground beef and pork. While Mr. S and I were in Stockholm last week, we made a point to try out a few restaurants that are known for the dish–popular with locals and visitors alike–to taste the real deal. And knowing we probably wouldn’t be able to find anything like it here in Tokyo. Not surprisingly, Swedish meatballs are just called meatballs in Sweden. What we found, as expected, is that the simple dish of meatballs, potatoes, and lingonberries can be elevated to great heights, if executed properly. Dare I say, even refined. Each version we tried was slightly different from the next. We enjoyed certain elements of each, noting the nuances between the size of the meatballs, the thickness of the sauce, the tartness of the berries, and many more details we never before stopped to consider about the dish. 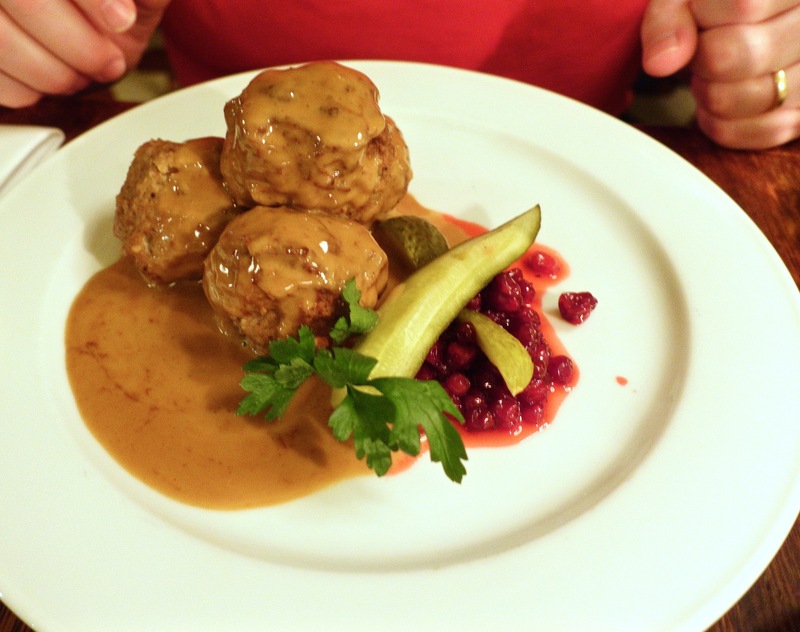 And of course, meatballs was not the sole dish we had at these restaurants–traditional Swedish food encompasses so much more variety, a fact that is not really known outside of Sweden. Not to mention modern Swedish cooking, which is incredibly inventive and at the forefront of Scandinavian cuisine. Which we also happily partook in. Located at the rear of the Opera House building, Bakfickan is a classy, timeless establishment with an intimate feel. 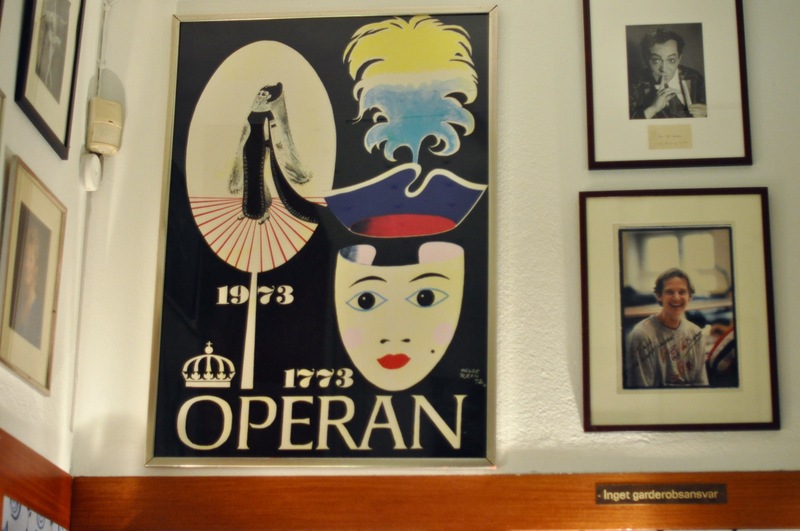 The restaurant consists of a beautiful U-shaped marble counter, seating 28, surrounded by a few high tables, and walls covered with pictures of famous opera stars and opera posters. The counter is the best place to sit as you have a better view of the kitchen, the hustle behind the counter, and fellow diners, who in recent years, comprise more and more of visitors as word spreads about the quality of the food here. Classic Swedish dishes dominate the menu–no fuss–just simple, hearty dishes that are well executed with a refined touch, and elegantly presented. We had dinner here on our first night in Stockholm, a Saturday, and there was about a 15-minute wait. 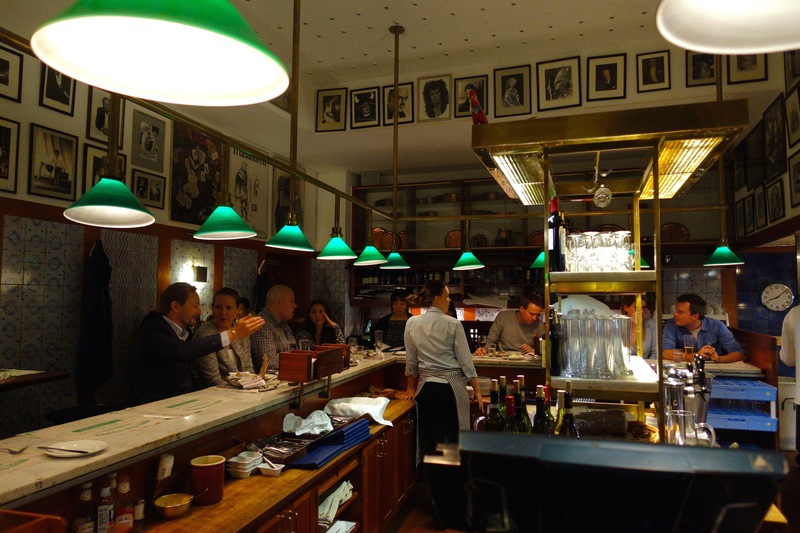 The bar was packed with groups and individual diners, some local, but mostly out-of-towners. Since Bakfickan has gained some renown for its meatballs, this was the popular dish coming out of the kitchen. 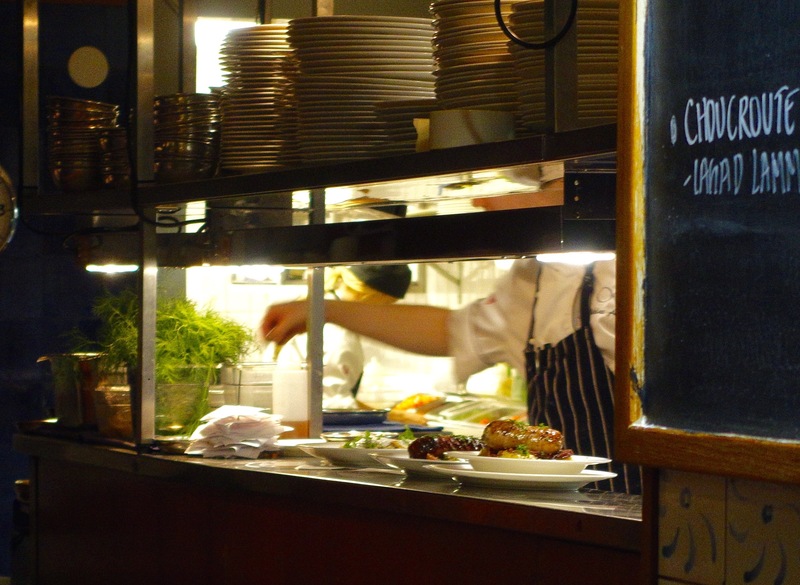 However, other menu items, including the daily specials written on a blackboard behind the counter, received attention as well. We ordered the meatballs (Köttbullar) of course, as well as the Steamed Cod (Ångad torsk) with shrimp, horseradish, and browned butter. 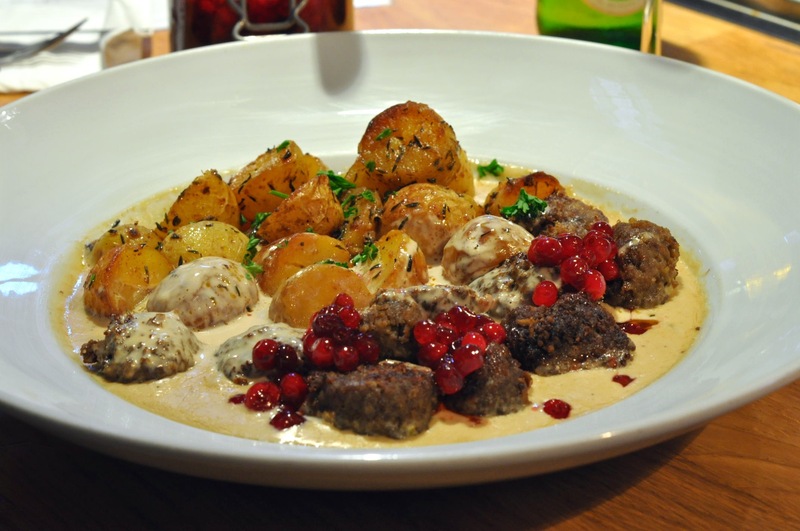 The köttbullar was presented piled on an elegant white plate, with a generous helping of light brown sauce. A side serving of whipped potato puree was served separately. 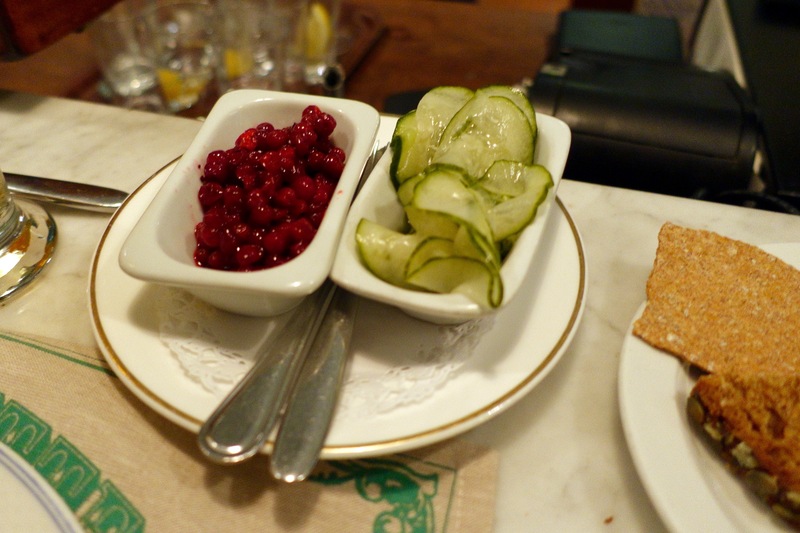 Small bowls of lingonberries and thin, pickled cucumber slices were brought as well. Meatballs: 8 small-medium. Nicely browned on all sides, moist, with good beefy flavor. Sauce: Light in texture (appeared to be slightly frothy), yet creamy. Very generous serving. My personal favorite. Potatoes: Silky and buttery rich. I liked that they were served on the side so you could taste them separately from the cream sauce. Lingonberry Sauce: Plump, whole berry sauce that is tart and sweet. Lovely. Other Recommended: Steamed Cod with shrimp, horseradish, and browned butter (comes with steamed potatoes with dill) (pictured below). “Isterband” sausage with capers, apples and beets, with chives creamed potato. Steamed Cod with shrimp, horseradish, and browned butter. 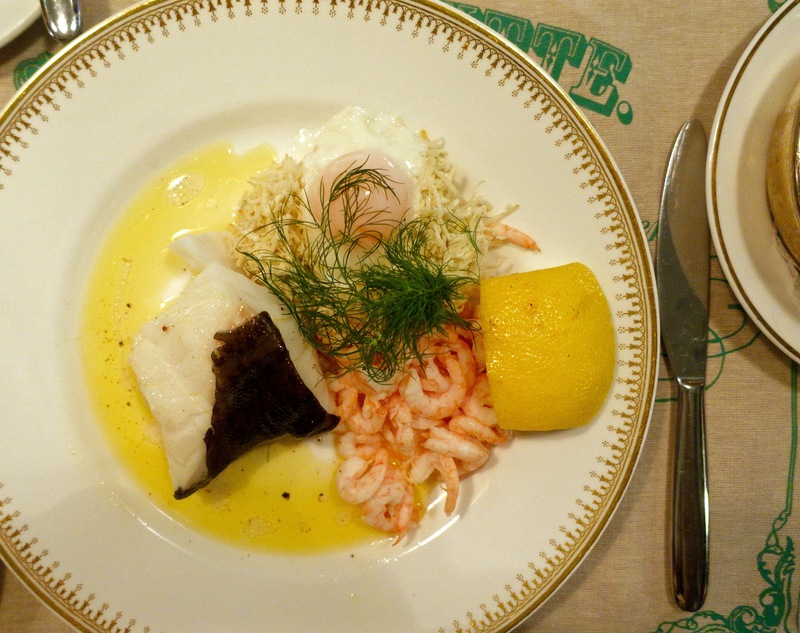 Flaky, fresh cod meat with little shrimp, fresh grated horseradish, a soft-poached egg, and dill. Poke the egg, and mix together with the shrimp to create a shrimp salad with poke and butter sauce. 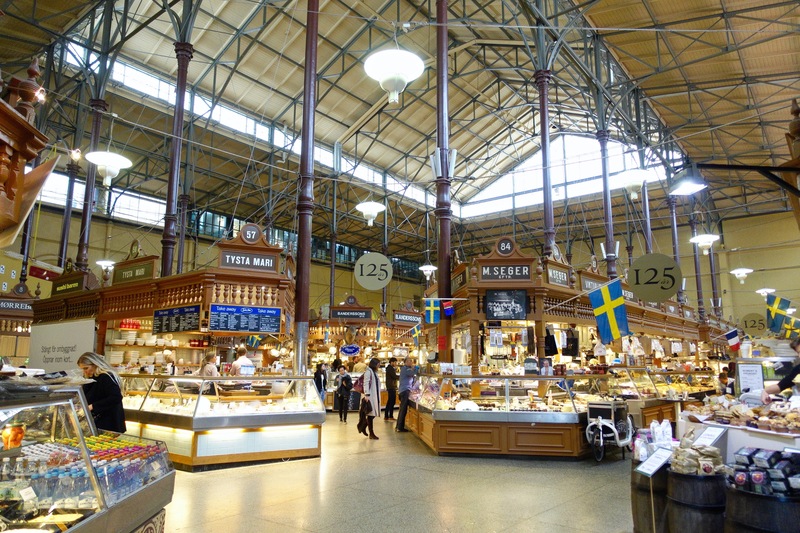 Husman’s is a vendor located in the Östermalms Saluhall Food Hall, otherwise known as Swedish old-world food mecca. Established in 1888, the hall’s interior comprises vaulted glass ceilings, reminiscent of a train station, above rows of antique stalls where food vendors, restaurants, and cafes are held. 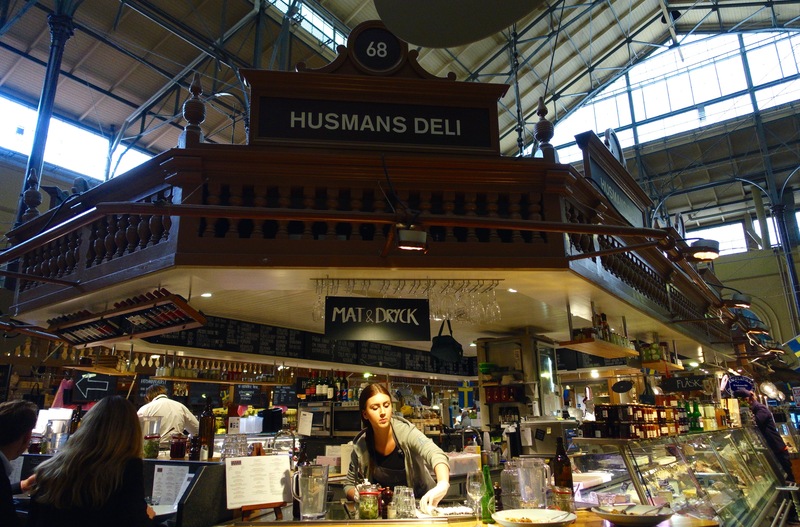 Husman’s is centrally located–a large ring of glass counter–displaying delectable cheeses, meets, prepared foods, and a dine-in counter that seats about 8. Vegetarians be warned: the dine-in menu comprises all meat dishes (although for take-away there are more vegetarian selections). Most are traditional Swedish classics like Minced Beef Patty with Cream Sauce and Capers, Potato Pancakes with Salted Pork, and Lamb with Dill Sauce. The lunch crowd seemed to be a mixture of local office workers out on lunch and tourists. Mr. S and I arrived for lunch, waited only a few minutes before finding 2 stools together at the counter. We ordered meat and more meat of course: Swedish Meatballs and, on a whim, Boeuf Bourguignon, which appeared to be the lightest item on the menu. With your main, you select a side: boiled potatoes, mashed potatoes, roasted potatoes, garlic fried potatoes, or white or brown rice. We both selected the garlic potatoes. As we are more accustomed now to Japanese portion sizes, what arrived nearly knocked us on our sides. Two enormous, shallow bowls filled to the brim with meat and potatoes were placed before us, a.k.a. American size portions! With a hefty task before us, we hunkered down and started to chip away at our food. 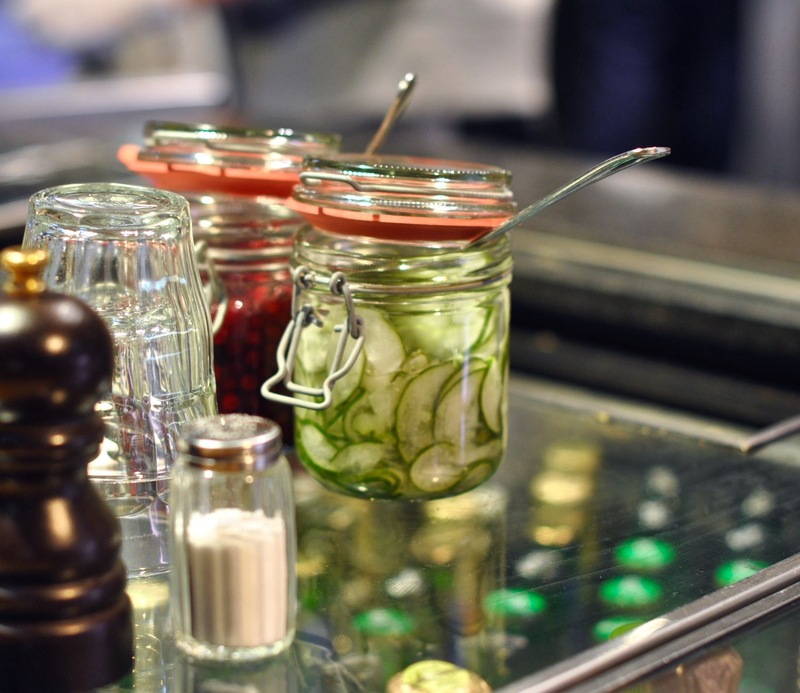 Here’s a tip, self-serve jars of lingonberry sauce and pickled cucumbers are placed at almost every seat, so help yourself to heaping amounts of each, which acidity and sweetness both stimulated our appetites more, and helped to balance all that savoriness of the meat. Meatballs: 10 small-medium. Appeared to have been deep fried, or pan-fried in oil as there was a thick crust. Insides were moist with rich flavor. Sauce: Very heavy cream sauce, so much so that the color was almost opaque white. Rich, and delicious first few bites, but too heavy for the entire dish. Potatoes: Well seasoned with garlic and herbs. A bit too greasy for me in conjunction with the cream sauce, but perhaps not for others. Lingonberry Sauce: Plump, whole berry sauce. Tart and sweet. Unlimited!! Other Recommended: Potato Pancake with Salted Pork, Boeuf Bourguignon (below). 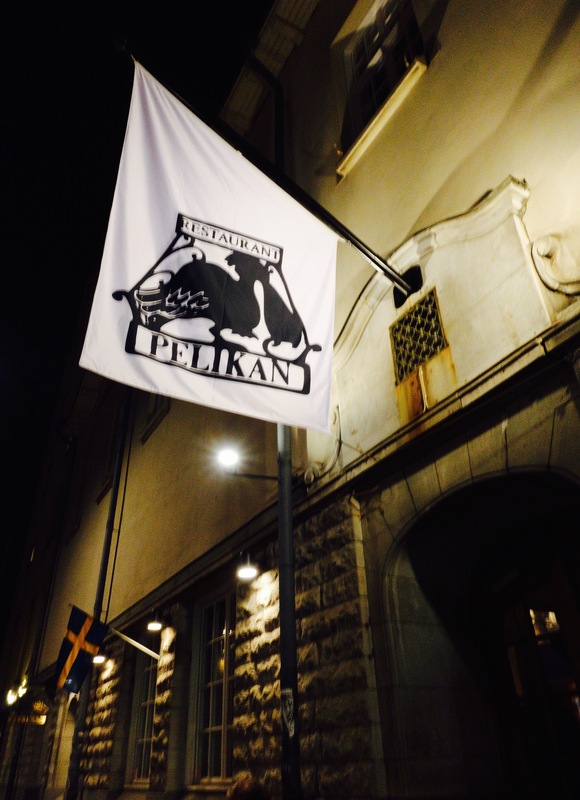 Pelikan is one of the oldest restaurants in Stockholm and is probably the first hit you get when searching for Swedish meatballs in Stockholm. The place is an institution. 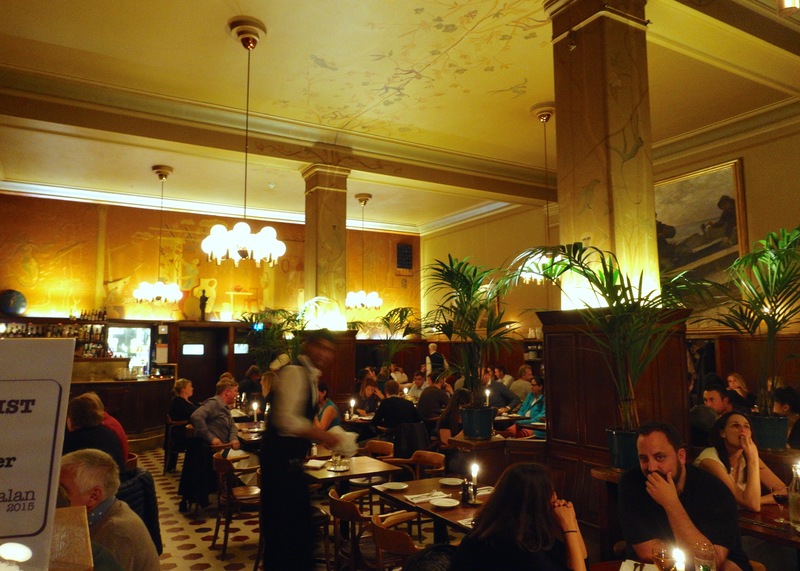 The interior, styled after a classic beer hall, has high ceilings, wood furnishings, brass fixtures, and a casual old world charm. 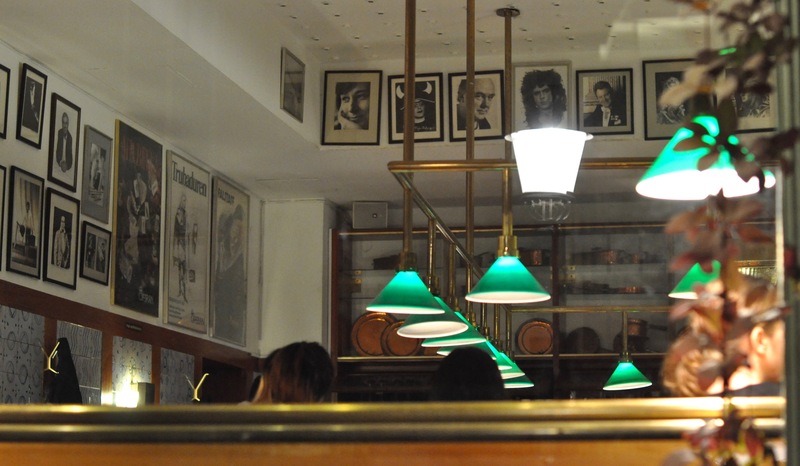 The diners are an eclectic mix, and the feel of the crowds is much livelier than either Bakfickan or Husman’s Deli. When a full house, which it often is daily, it’s hard to even hear your own voice over the chatter, which is that much more amplified in the cavernous space. 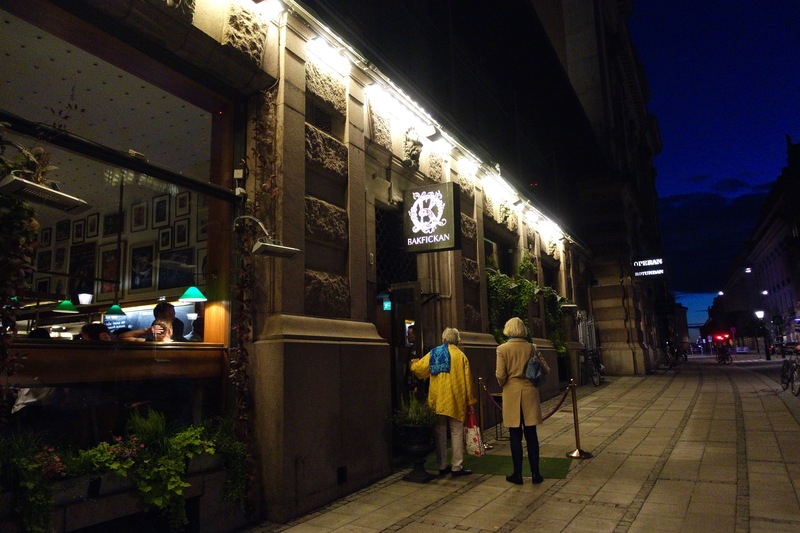 We arrived for dinner on our last night in Stockholm–symbolically starting and ending our stay with köttbullar. Without a reservation, we had to wait for about 15 minutes, in the Pelikan’s bar and lounge area, called the Kristallen (the Crystal). 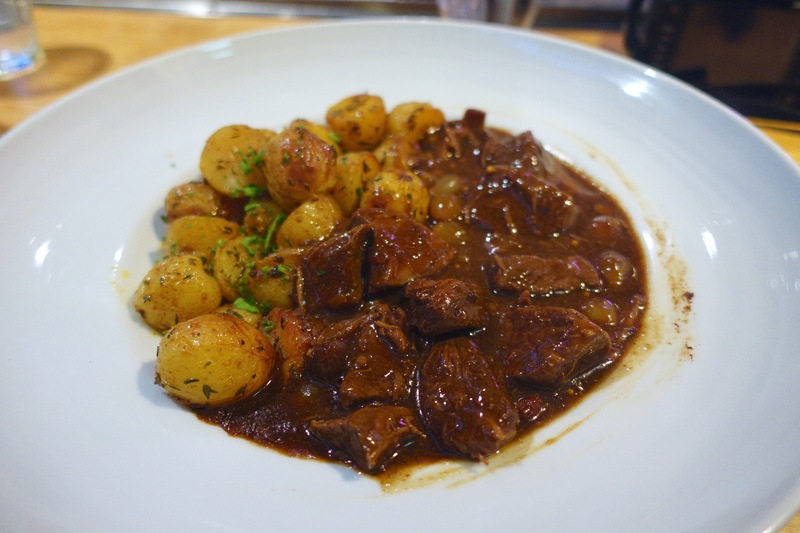 The menu, of course, is classic Swedish fare, heavy on meat and potatoes. If none of these fancy you, look for the daily specials posted on a board on the wall–more meat and potatoes. 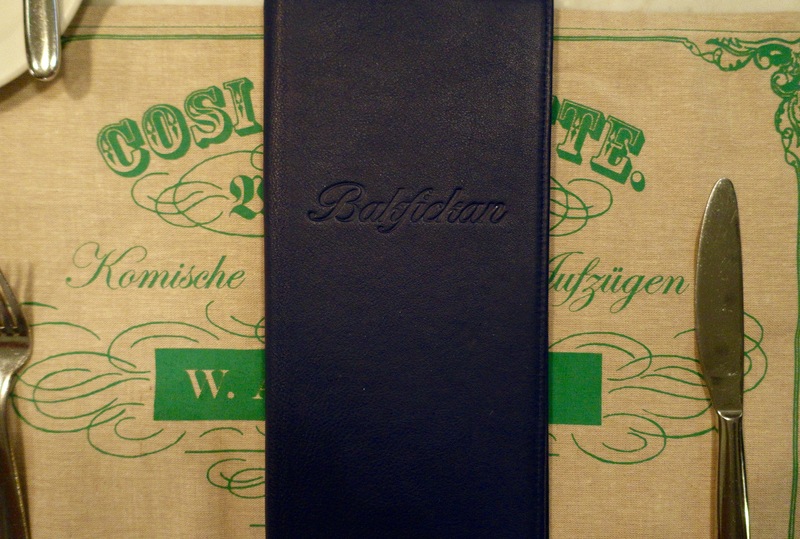 So many items sounded interesting, but we settled on the Pelikan’s Meatballs and Västerbotten Cheese Pie (a semi-hard cow’s milk cheese–resembling Parmesan–made by a single family in the Västerbotten region of Sweden..more on this later in another post). Dinner begins. We are presented with a plate of very large meatballs smothered in cream sauce with a side of lingonberries and pickle spears. Meatballs: 4 large. Dense and meaty balls (no delicate way to put this!). Very hearty and filling. Sauce: Very thick, like a gravy, with strong beef flavor, rather than creamy. Eats like a meal on its own. Mr. S’s favorite sauce. Potatoes: (not pictured) Served on the side were a bowl of mashed potatoes. Not as silky and buttery as Bakfickan. Average. Lingonberry Sauce: Plump, whole berry sauce. But, not enough for the amount of meatballs on the plate. We asked for extra sauce. Note: I was not a fan of the pickles here, which tasted like Vlasic jarred pickles. 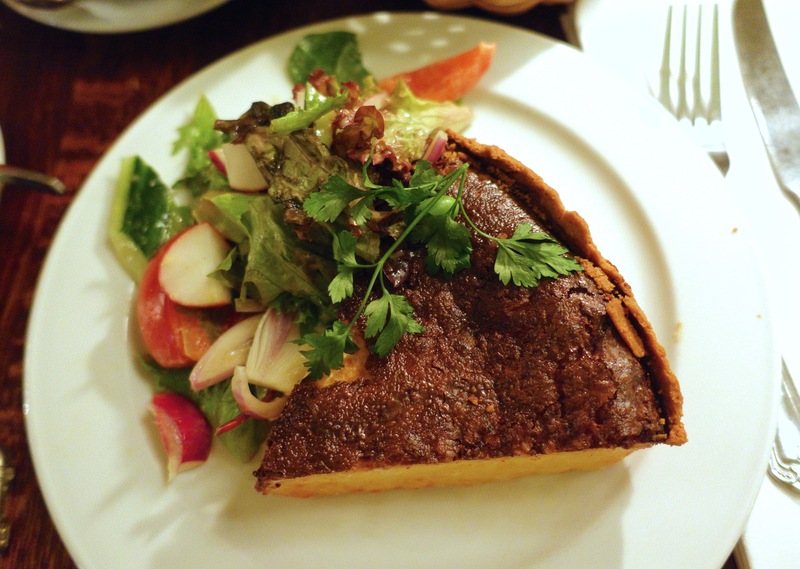 Other Recommended: Västerbotten Cheese Pie with Salad (below). Boiled Knuckle of Pork with Mashed Swedes (i.e., rutabaga) & Three Kinds of Mustard. Västerbotten Cheese Pie with Salad. So the verdict? My pick is Bakfickan. Not only am I partial to a small size köttbullar, the lighter and somewhat frothy cream sauce sold me. The whipped potato puree was also an incredibly refined interpretation of mashed potatoes. As for ambiance, Bakfickan is small and intimate. The counter model provides each customer with much personal attention that is not available at a large restaurant like Pelikan. We also found the staff to be more personable and warm here. And Mr. S’s choice? Pelikan takes the win for him. He notes that the meatballs have richer taste and are more satisfying, and particularly is a fan of the thicker gravy-like sauce which he describes as more peppery and well-seasoned. 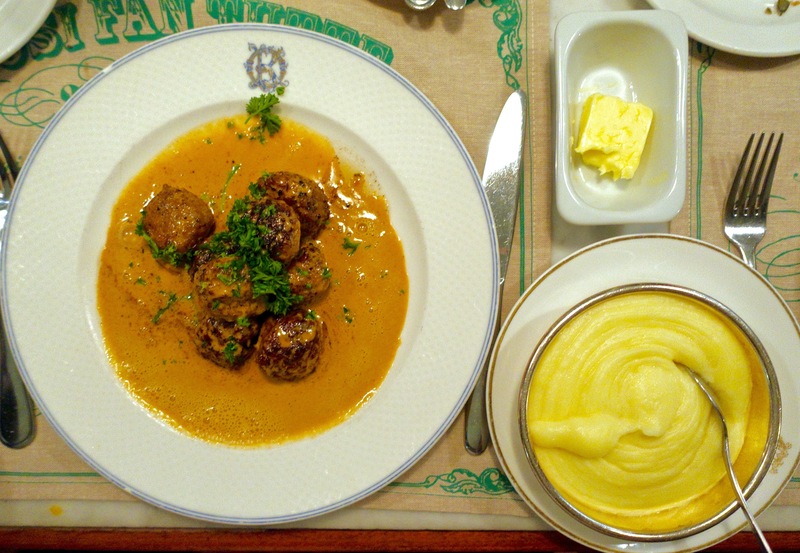 Next time you’re in Stockholm, give these köttbullar a try–one, or all three. wow great review! Your pictures are really neat and make the places AND the dishes very appealing. Special thumbs up for the Husman’s Food Hall, the place looks great and amazingly clean, classy and chic 🙂 Definitely good to know about these places if I ever go to Stockholm. Thanks!! !